A new set of OSHA rules will expand the list of work-related accidents that employers are required to report, regardless of the size of their business or their industry. Previously, employers had only to report accidents that resulted in either a fatality or the hospitalization of three or more employees. OSHA believes these changes will improve its ability to identify hazards in the workplace and prevent serious injuries and fatalities. “Hospitalizations and amputations are sentinel events, indicating that serious hazards are likely to be present at a workplace and that an intervention is warranted to protect the other workers at the establishment,” said Dr. David Michaels, assistant secretary of labor for occupational safety and health, in an OSHA press release. MSDSonline offers educational content to help companies comply with these and other upcoming OSHA regulations. For example, MSDSonline’s Recordkeeping Webinar provides immediate access to everything you need to know to get and stay in compliance with new OSHA standards. This webinar covers all changes to recordkeeping law, and also includes overviews of common forms, I2P2, recordable versus non-recordable incidents, timelines and deadlines, and fines and penalties. In addition, the webinar features a fun game that tests viewer knowledge of the Recordkeeping Standard. To learn more about MSDSonline’s Recordkeeping solutions and other resources click here. 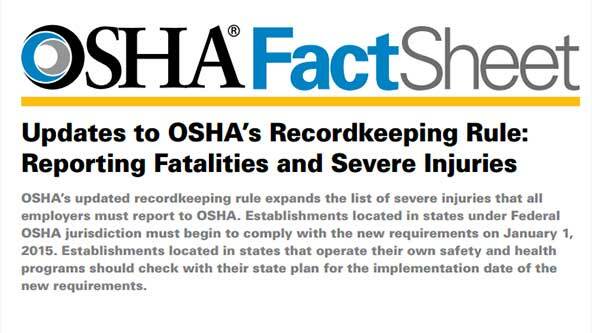 To directly access OSHA’s announcement of these updates click here.